Dominoes are descended from dice, and in their simplest form, contain twenty-eight pieces (or "bones") marked in every combination of 0-6 dots (or "pips"), two per piece. 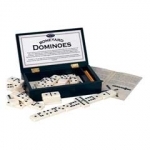 Other domino sets contain a larger number of pieces, with a correspondingly larger number of pips per piece, up to 18:18. 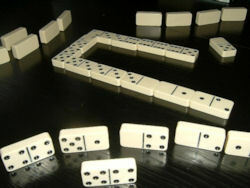 Traditionally, dominoes are carved from bone or ivory, with round ebony pips inset on one face, though today, pieces are often made from wood or plastic, with painted dots. Like playing cards and dice, dominoes are a somewhat generic piece of gaming equipment. 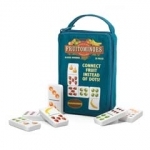 Many different games can be played with dominoes, ranging from single-player solitaires to multi-player games, played both for fun and for money. For more domino resources, check out the links page. For domino games you can play on your computer, try some of the programs listed on the Domino Software page. In nearly all domino games, play begins with the dominoes spread out face-down on a table, and manually shuffled by simply moving them around with the fingers. Players draw a certain number of pieces from the table to form a hand, with the remainder comprising the "boneyard". The object is generally to be the first to get rid of all the pieces in your hand. 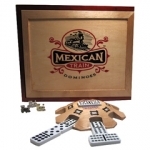 Here are rules to some of the most popular domino games: The Draw Game, The Block Game, Muggins, Matador, Bergen, Mexican Train, Chickenfoot, Forty-Two. Head on over to Domino-Games.com for a complete listing of domino game rules.